Outsource2india engaged with a New York-based contemporary theatre company to handle the audio transcription for their productions. Despite the cost, quality, and timeline constraints from the client, O2I worked on the projects, offering the best quality within the defined cost and timelines. The client is a theatre company based out of Brooklyn, New York. The company uses contemporary theatre as an effective medium for artistic innovation and establishes a bonding between theater and society. The themes for their plays are often out-of-the-box concepts which are based on creative investigations conducted in society. Since a large volume of the client's inspiration comes from social interaction with people, productions like plays, telephonic interviews and single-tier interviews required audio transcription in English. Further, they also required time stamps to be embedded at predefined intervals. O2I was approached online 6 months prior to commencement of the project but the process was delayed due to client's budgetary constraints. After reestablishing contacts with Outsource2india and before initiating the audio transcription project, there were a few challenges that had to be addressed. We took these decisions based on the volume of audio transcription and set up a team of 3 - 4 members to meet timelines and delivery schedules. As part of the standard procedure, all transcripts undergo thorough quality checks. With the number of miles put in on audio transcription, the client signed the contract without a trail and a one-time project was converted into a large audio transcription assignment for O2I. 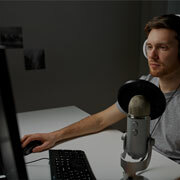 Today O2I has the capability and talent to excel in some of the most challenging environments and offer quality audio/video transcription for any type of industry. If you have a similar or unique transcription requirement, contact us today.